In a world where more and more people are concerned about eating healthier, the industry surrounding food and beverage has done an excellent job of deceiving us. Sometimes, we might think that we are making a better choice when, in fact, there are things hidden in that food that may be going against our goals. A perfect example is salad at restaurants. Some of the hidden calories are things like salad dressing, cheese, croutons, olives, avocados, and bacon. Adding protein like chicken or fish to your salad will also add calories, but it will help you feel more satisfied with your salad choice and make you less likely to grab a few fries from someone else’s plate! When choosing a salad at a restaurant, always order dressing on the side. It is best to dip your fork in the dressing and then grab some veggies with it versus pouring the dressing over the salad. That way you get enough of the salad dressing to taste it but you don't end up overdoing it. Also, look for things that you might sometimes enjoy but also can add those extra calories. Perhaps you like croutons but you decide that you don't absolutely need them. Ask the server to leave them out for you so you are not tempted. These are some of the things you can do to make a salad at a restaurant a more healthy option for you. Another example of a seemingly good choice that might sneak up on you is a fish entree. Let’s look at a salmon dish with broccoli and mashed potatoes. Looks like a seemingly balanced meal with protein, vegetables, and carbohydrates, right? However, the fish (and almost always the vegetables, too!) was most likely cooked in some sort of oil or butter and the mashed potatoes probably have whole milk or cream, cheese, or some other sort of high-fat dairy product in them. While it is still a balanced meal, if you look at all these things together, you can see how the calories are going to add up. 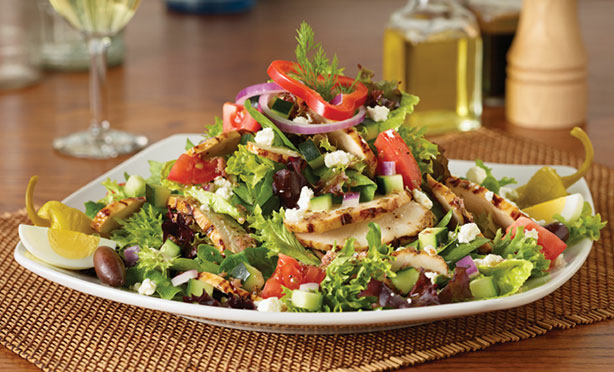 Similar to the salad, you could order this meal in a much healthier form. Ask them to steam the fish or cook it without oil. Same goes for the vegetables - ask them to steam them instead of preparing them n oil or butter. The mashed potatoes are probably already made, but you may be able to ask for a baked potato instead. That way you can control how much of the toppings you put on the potato (remember to ask for those toppings on the side). Today, think of your more favorite dining options. Are they in line with your goals? Perhaps you have discovered that there are some hidden calories in your favorite meals but you could make them better. Write those things down and try to remember them the next time you are in those situations. If you go out to eat today, try to make the best choice or make a good choice into an even better choice and then post about it on Facebook!